Specialty contact lenses are a fun way to change your eyes to look like your favorite entertainer or to create a spectacular costume. Specialty contacts, sometimes called decorative, fashion or theater contact lenses, temporarily change the look of your eyes without correcting your vision. 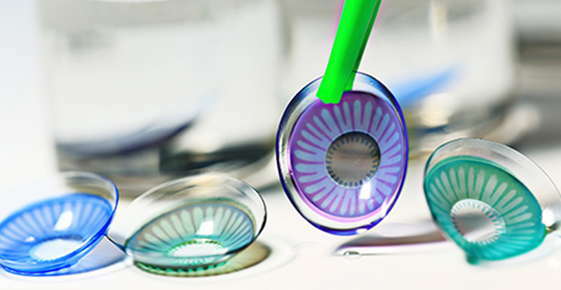 Eye care professionals can prescribe specialty contact lenses that fit well and look amazing. Wearing specialty contacts without a prescription, however, can be dangerous. Health regulators warn that buying contact lenses without a prescription is dangerous. Contact lenses are medical devices; incorrect use or poorly fitting contacts can cause real damage to eyes. There is no such thing as a “one size fits all contact lens,” as eyes vary slightly in size and shape from person to person. All contact lenses, including specialty contacts, can pose a danger when they do not fit the wearer correctly. Poorly fitting contacts can scratch the surface of the eye or even cause blood vessels to grow into the cornea, which is the transparent window covering the front of the eye. Improper use and care of specialty contacts may lead to painful eye infections that cause blurred vision and require weeks of medication. Damage to the eye may be permanent and affect lifelong vision. You may be tempted to leave specialty contacts in too long, especially in cases where you are wearing them as a disguise or as part of theatrical makeup. If you do not wear contact lenses regularly, you may not be aware of the signs telling you that it is time to take out your lenses. To reduce your risk for eye damage, remove your lenses if you notice signs like red eyes, swelling, excessive discharge, or pain in or around your eyes. U.S. Food and Drug Administration. "Decorative Contact Lenses." 2014.